Speaking on the actual number of soldiers that died in the Metele attack, Agim said contrary to speculation that more than 170 soldiers died, only 23 died in the attack. The dead, he said, included the Commanding Officer and the Intelligence Officer. “We have 23 soldiers that died, including the officers. The officers were Intelligence Officer, the Commanding Officer and the 2IC. 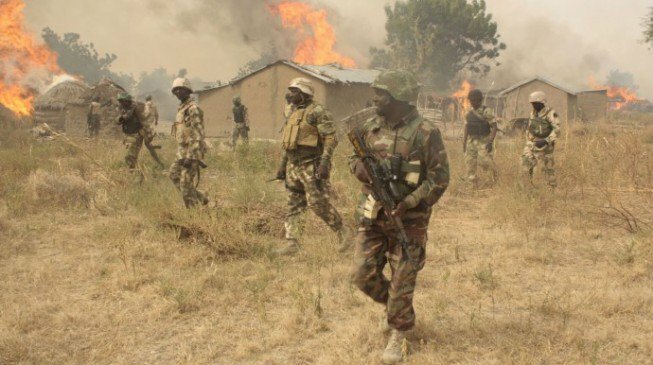 Also, we have 31 troops that were wounded in the unfortunate attack,” he said. Also, over the weekend, indications emerged that the decision of the Chief of Army Staff, Lt. General Tukur Yusuf Buratai, to carry out massive redeployment of several Brigade Commanders and Commanding Officers in the ongoing battle to eliminate Boko Haram terrorists from the North East was due to the need to restore confidence and high morale among fighting troops. It was also gathered that concerns about the strict adherence to implementation of allocated allowances and other welfare packages for troops which had been filtering into the ears of the Army Chief, which became louder, following the November 18 Boko Haram attack on Metele base in Guzamala Local Government of Borno State, spelled the last straw. Vanguard gathered from a General in the Army who spoke in confidence that because of the determination of the COAS to ensure maximum morale among troops in routing Boko Haram terrorists, he had bypassed bottlenecks in the disbursement of allowances due troops prosecuting the operation. He was also said to have ordered that funds for troops’ welfare be sent directly to the Field Brigade Commanders and Commanding Officers of Units and Battalions for direct disbursements to troops. “So it was a surprise to the authorities that some revelations that came out after the Matele attack pointed to issues of allowances to troops as one of the things that affected morale,” the officer said. Asked why some soldiers who got injured in several gun battles with terrorists were left to cater for themselves by buying drugs, the officer said though he was not in a position to confirm the development, it also bordered on welfare which was one of the reasons for the COAS’ action. Regarding the issue of payment of N1,000 RCA to troops in the battle front, the officer said the Army authorities, particularly the Chief of Army Staff, should be commended for paying N1,000 which was hitherto N500 daily. “Mind you, this is aside from their normal feeding which is provided by the Army as at when due. As I speak with you, every other soldier outside operational areas receives N500 daily as RCA. So there is no foul play there,” he said. Speaking on allegations that many more soldiers (over 100) were killed by Boko Haram during the Metele attack, than the 23 dead and 31 injured quoted by Army headquarters, the senior officer said he could not dispute the casualty figure of the Chief of Army Staff, noting that there were procedures and investigations backing the figure released by the authorities. He added: “Those choosing to doubt the Army should know that the dead are dead. They have families. So what will be the gain of saying somebody is alive when he is dead or denying when he has a family”. Meanwhile, President Muhammadu Buhari has assured His Majesty King Abdullah II bin Al-Hussein of Jordan that he would continue to work towards total elimination of terrorism in the Lake Chad basin area. President Buhari gave the assurance, yesterday, when he received a condolence message and assurance of support in the fight against terrorism from the Jordanian King who prayed for peace and calm in Nigeria, and throughout Africa. A statement by the Senior Special Assistant to the President on Media and Publicity, Mallam Garba Shehu, disclosed that the condolence was sent through telephone conversation. According to the statement, King Abdullah, who is from the Hashemite family of Jordan, commended the Nigerian Army for its courage and resilience in the face of challenges in fighting terrorism. President Buhari thanked King Abdullah for his concern on the recent setbacks that led to the loss of lives of soldiers in the North East. The President assured that several measures had been discussed and were being implemented to steer the country from the unfortunate occurrence.